Supporters of presumptive Democratic presidential nominee Hillary Clinton have objected to proposals calling for a ban on fracking in the Democratic platform. 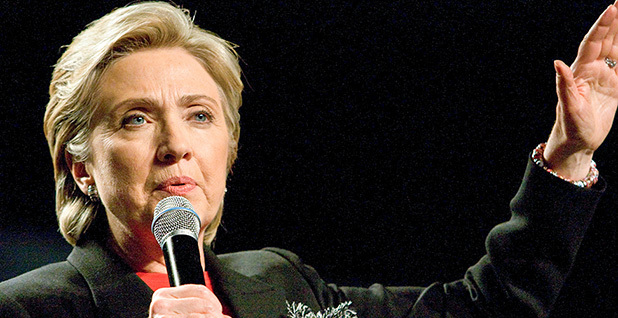 Clinton and her supporters have called for additional regulation. Photo by Brett Weinstein, courtesy of Flickr. Regardless of whether the proposal passes, it will likely remain unclear what such a ban would entail. How would it be accomplished? When would it start? Would it ban the process of hydraulic fracturing or drilling altogether? The party platform is, after all, a philosophical document to be adopted at the national convention rather than a piece of legislation. And those who want that platform to include a fracking ban are likely to lose. Nonetheless, just having one of the country's two major parties talking about severe curtailment of domestic oil and gas production shows the traction that the anti-drilling movement has gained with the political left. The supporters of Sen. Bernie Sanders (I-Vt.) who want to ban fracking have already lost a round in voting two weeks ago at the platform drafting committee in St. Louis. But Josh Fox, the anti-drilling documentary filmmaker and platform committee member, plans to try again with the larger platform committee, which meets today in Orlando, Fla.
Fox acknowledges that the amendment he's presenting is short on details. He's well aware that the oil and gas industry defines hydraulic fracturing much more narrowly than activists like himself. "If it came down to that, we define it as the waste pits, the truck trips and all that," Fox said in a phone interview as he prepared to board a train to Orlando. Fox has two amendments he plans to propose. The first simply expresses support for a "national moratorium on fracking." The second references the Obama administration's Clean Power Plan and says it should create incentives for renewable sources of energy and avoid the development of "fracked natural gas plants." Fox says he considers the second proposal more important because building a new fleet of natural gas power plants would lock in natural gas production for decades, worsening climate change and sea-level rise. "Do you want 300 fracked gas plants, or do you want the East Coast?" Fox said. "You can't have both." Carol Browner, U.S. EPA administrator under President Bill Clinton, argued against a ban on drilling at the drafting committee meeting in St. Louis in late June. But Browner, representing presumptive Democratic nominee Hillary Clinton's campaign, said the regulatory exemption for fracturing commonly referred to as the "Halliburton loophole" should be eliminated. "We believe it needs to be regulated," said Browner. "We do not support a national ban on fracturing." A labor representative also spoke against the proposed ban, saying it could cost jobs. During the Democratic primary, Sanders said flatly that he opposed fracking without offering definitions. Clinton said she would back regulations on water contamination, as well as disclosures for chemicals used in fracking fluids. She also supported blocking fracking where local or state governments oppose it. "So by the time we get through all of my conditions, I do not think there will be many places in America where fracking will continue to take place," Clinton said (EnergyWire, March 7). Defeating the frack-ban proposal could create friction between Clinton and the liberal activists who fueled Sanders' surprisingly strong bid for the nomination. But passing it could create problems for Democratic candidates in oil states and other conservative districts. And either way, confusion will likely continue as to what "fracking" really is. The technical definition used by industry is that fracturing is a portion of the well construction process in which large volumes of water is pumped into a well to crack open rock and release gas. The process was developed in the late 1940s and was primarily used to get more oil and gas out of existing wells. In recent years, oil companies have perfected drilling techniques to extract gas from formations that could not be tapped at all without fracturing. The newer methods use far more water and pressure. They have spread oil and gas development into areas that hadn't seen drilling in generations. More than 90 percent of wells brought online onshore in the Lower 48 states in 2015 were fracked in some way, according to IHS Energy. Fracturing is less common offshore, and if offshore wells are included, that figure falls to 65 percent. To critics, fracking has come to mean everything associated with the onshore drilling boom, from when land is cleared for a well all the way through to plugging the hole. There's also differences in what is considered a ban. New York's ban still allows low-volume fracking. In 2014, New York's 12,826 wells produced more than 350,000 barrels of oil and 20 billion cubic feet of gas. A moratorium imposed in Maryland last year, however, prevents any kind of hydraulic fracturing, no matter how small the volume. When he proposed a fracking ban at the platform committee in St. Louis, environmental activist and Sanders representative Bill McKibben described his proposal as being akin to New York's fracking ban. One possible reason for the lack of specifics in the debate is that presidential and congressional campaigns rarely focus directly on oil and gas production. That's because the federal government exercises relatively little authority over onshore drilling. Regulation of oil and gas is generally done by state agencies, with federal officials playing at the edges with rules on air quality and waste disposal. But just because Congress hasn't gotten involved in onshore drilling doesn't mean it can't. Legal experts say oil and gas development is clearly interstate commerce, giving Congress the authority to weigh in. "I don't see anything preventing a congressional act to ban the practice," said Hannah Wiseman, a Florida State University law professor who specializes in energy and environmental law. But Wiseman and Jason Hutt, an energy lawyer at Bracewell LLP, said EPA wouldn't have authority to ban fracking on its own. Wiseman said EPA might have some authority to rein in drilling by getting tougher on disposal rules. But Hutt said he wouldn't expect a Clinton administration to clamp down on broad swaths of the industry. Blocking drilling in states that oppose it, for example, wouldn't change much in high-production areas like Texas, Oklahoma and North Dakota. Instead, he would expect a Clinton administration to use what authority it has to take on specific environmental problems. "I think there will continue to be footholds to address the challenges that come up," Hutt said. "I expect they would continue to look at places to address those challenges."